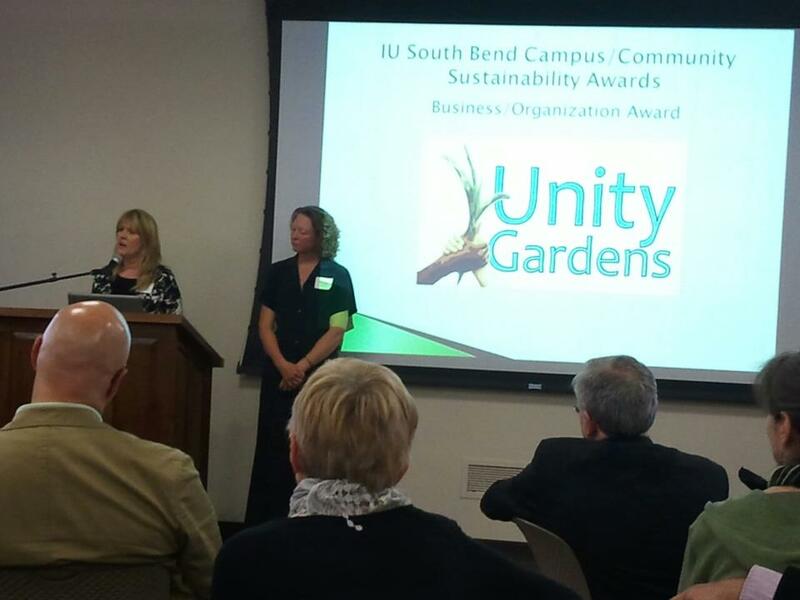 The IUSB Center for a Sustainable Future has chosen to honor Sara Stewart and Unity Gardens with this year’s Organization of the Year award. The award, one of four given annually by the center, recognizes individuals, groups and businesses that make significant contributions to a more sustainable future in Michiana. Unity’s focus on local food production, all within a framework of strengthening and empowering communities and their leaders, has grown in its fifth season to include dozens of gardens. Unity Gardens connects people to healthy food, and each other. But Unity’s emphasis on educating both children and adults helps to promote a sustainable future through changing lifestyles, by improving community health and fostering a love of growing and connection with nature. Among the latest Unity projects is a native planting area at the flagship LaSalle Square garden on South Bend’s west side. The introduction of the plants, education about their role in the ecosystem and the introduction of bees to improve pollination go beyond the backyard tomato. Countless volunteers, donors, agency partners and officials have helped to further Unity’s success. Sara’s thank-you remarks at the awards ceremony graciously expressed the true vision of Unity when she stressed that really, all we can ever hope to grow is each other. Other award winners included Myles Robertson, IUSB student extraordinaire who won the student award; Carl de Bruyn, assistant director of facilities, for campus staff contributions; and Charlotte Wolfe, who was recognized with the Community Individual Sustainability Award for her sustainable farming and native landscape restoration at Prairie Wind Farms, her home north of Lakeville.